Obama’s ambitious budget passed it's first hurdle Wednesday night when a House panel approved most of it in a party line vote. WASHINGTON – President Barack Obama's allies rallied around his ambitious budget blueprint as he visited the Capitol on Wednesday, and only hours later a House panel endorsed it, pointing the way for major legislation this year on health care, energy and education. Even so, both the House measure approved by the House Budget Committee on a party-line vote late Wednesday night/early Thursday and a companion Senate plan lack specifics for any of the administration's signature proposals. And Democrats, particularly in the Senate, decided to cut spending and reduce exploding deficits below levels envisioned in the plan Obama presented less than a month ago. The Senate Budget Committee was expected to approved its version of the measure Thursday, preparing it for a vote by the full Senate next week. Administration officials and congressional leaders said any differences were modest. "This budget will protect President Obama's priorities — education, energy, health care, middle class tax relief and cut the deficit in half," Senate Majority Leader Harry Reid, D-Nev., said after Obama met privately in the Capitol with rank-and-file Democrats. Earlier, White House Budget Director Peter Orszag told reporters the congressional budgets "may not be identical twins to what the president submitted, but they are certainly brothers that look an awful lot alike." Neither house included the $250 billion that the administration seeks for any future financial industry bailout. Additionally, Both House and Senate Democrats assume in their version that Obama's $400 tax credit for most workers will expire after 2010 and fail to permanently extend relief from the alternative minimum tax. The House plan calls for spending $3.6 trillion in the budget year that begins Oct. 1, according to the Congressional Budget Office, compared with $3.7 trillion for Obama's plan. The Senate would spend $3.5 trillion. Obama's budget would leave a deficit of $749 billion in five years' time, according to congressional estimates — too high for his Democratic allies — and would grow to unsustainable levels exceeding 5 percent of the economy by the end of the next decade. Given the strong Democratic congressional majorities in both houses, there is little or no doubt the spending blueprints can pass both houses next week. But Republicans greeted them with criticism nonetheless. Rep. Paul Ryan, R-Wis., said Democrats were advancing "the president's high-cost, big-government agenda in camouflage. ... Instead of simply righting the ship, this budget steers it in a radically different direction straight into the tidal wave of spending and debt that is already building." Ryan, who is the senior Republican on the House Budget Committee, and GOP colleagues are expected to unveil an alternative on Thursday. No similar effort is expected in the Senate. Meanwhile, House Budget Committee Democrats batted down on party-line votes a host of GOP amendments to curb spending, preserve tax cuts for wealthier taxpayers and small businesses, and oppose Obama's plans to curb greenhouse gases during an all-day debate. The budget is largely a nonbinding statement of targets for lawmakers to meet as they look ahead to the next fiscal year. At the same time, the budget sets limits on overall domestic spending and on defense and — perhaps equally important — anticipates later legislation on health care, energy and education. The House budget, for example, would establish fast-track rules for legislation the White House wants for remaking the nation's health care system, as well as for another measure to have the government begin making loans directly to students. Both budgets also would create deficit-neutral special accounts that will be used to pay for Obama's signature initiatives, a step that Orszag specifically noted in his comments to reporters as a key element of the administration's own budget. Nor were Democrats willing to let Republican charges go unanswered. "President Bush has left President Obama a hard hand to play: an economy in crisis and a budget in deep deficit," said Rep. John Spratt, D-S.C., chairman of the House Budget Committee. 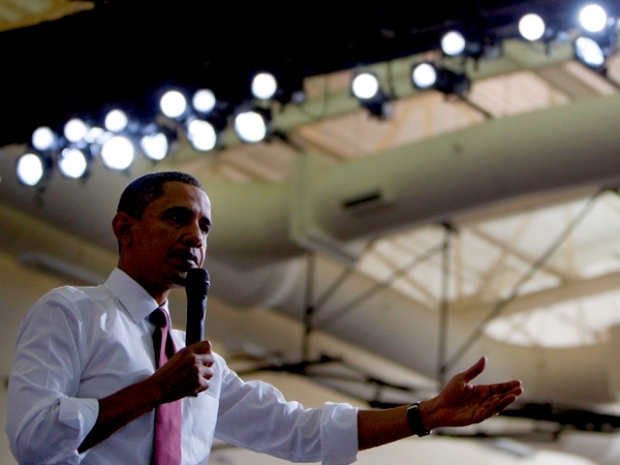 "President Obama has responded with a budget that meets the challenge head-on." Democrats also made several decisions that reflect their priorities and mark a major change from those favored by the Bush administration and Republicans. Each of the two houses' plans envisions substantial increases in core non-defense domestic programs over the Bush administration's final year — $35 billion in the case of the Senate and $42 billion for the House — although both are smaller jumps than the administration's figure of almost $50 billion. Those differences are relatively modest in the context of spending more than $500 billion on the programs involved. Both House and Senate are embracing Obama's core defense budget, granting a 3.8 percent increase and endorsing his assumption of $50 billion annually for wars in Iraq and Afghanistan, a figure many believe is too low as the war in Afghanistan continues to escalate. But defense spending slows further in subsequent years, which is sure to put pressure on acquisition of weapons systems. Still, the administration appeared sensitive to the perception that the president's key tax cut proposal might be ended in two years. Orszag announced that an administration board headed by former Federal Reserve Chairman Paul Volcker would have until December to study the issues of tax simplification, closing tax loopholes and reducing "corporate welfare." The result could be to make additional revenue available that might close the deficit, pay for Obama's tax cuts in the future, or both.